The IRA appears to have ruled out meeting the consultative group looking at how best to deal with the past. 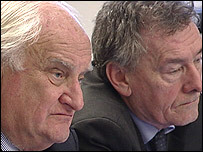 The co-chairmen, Denis Bradley and Lord Eames, want a meeting to discuss the IRA's willingness to reveal details of its activities during the Troubles. Republican sources, however, said that was "highly unlikely". The group has already met MI5 and the UVF. The IRA stance is seen as a major blow for the group which was set up to design a process to deal with the past. Lord Eames and Denis Bradley have said repeatedly that all groups involved in the Troubles must be prepared to co-operate if such a process was to work. They have met hundreds of people including representatives of the security forces, victims of violence, and politicians including Sinn Fein. They had been hopeful that the IRA leadership would agree to their request for a meeting to discuss its possible involvement. A republican source said the IRA had no confidence in the process because the British government had established the consultative group and set its terms of reference. A spokesman for the group said it had no comment to make at this stage.